Complaints provide an opportunity for improvement. And this is precisely how complaints need to be viewed in the area of GxP-relevant processes. The quality and safety of products must be checked and improved on an ongoing basis. Complaints from customers and consumers provide valuable input for this continuous improvement process (CIP). However, this can only help to improve things if all complaints are recorded and processed centrally. In this context, processing means checking, resolving errors and issues, as well as root cause analysis. The enaio® Complaint/CAPA best-practice solution provides your employees with simple and fast options for recording complaints. The solution delivers a workflow-based approach that ensures a controlled process. No information gets lost, the status can be viewed at any time, and each action can be monitored individually. Reminder functions ensure prompt implementation of measures, and all activities are documented continuously. 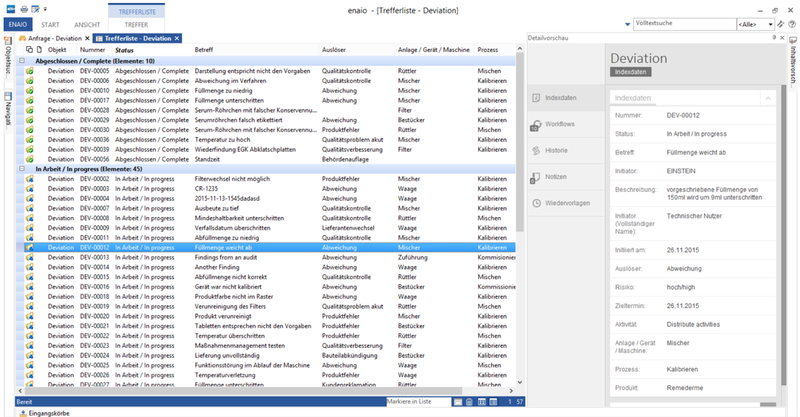 All information and measures in a single workflow. New complaints are processed and entered into the workflow in the shortest possible time. Rapid processing made possible by enaio® improves your response time. A digital archive facilitates fast information retrieval. Every new complaint is captured, entered into the workflow, and processed directly. enaio® delivers a complete DMS solution for product testing and complaints. A record is created in enaio® for each process. Each complaint is categorized and prioritized, linked to reminder and evaluation functions, and released for archiving. Process complaints reliably and in compliance with relevant standards. The application is easy to use and creates a high level of transparency across the entire processing chain. Moreover, the complaint form can be customized. Users can lodge complaints via an Internet browser. enaio® thus takes the data capture step very close to the person who reports an issue. The complaint process starts immediately after the message has been saved. Our Complaint/CAPA best-practice solution also takes into account the growing trend towards subjecting everything to risk assessment. However, the assessment and evaluation of a risk remains the responsibility of the persons involved in the process. The enaio® best-practice solution serves as a tool to better process, monitor, and document the tasks involved. When decisions regarding product quality are made based on data processed in complaint management, you must be able to rely on the integrity of this data. According to the recognized ALCOA concept, data must be attributable, legible, contempor­aneous, original, and accurate. With the enaio® best-practice solutions, you can rely on the fact that you will comply with these rules. Complaints from customers and operating personnel, error and adverse event reports, complaint management for customers and employees.